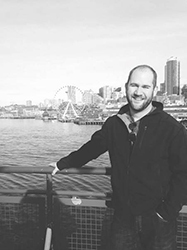 This week we're showcasing Program Manager Josh Lehr. Josh has been at Mortech for three years, and currently lives in Lincoln with his girlfriend, Abby, and his dog, John Wayne. Favorite things to do on his days off: On my day off you will find me one of four places: on the golf course, in the sand volleyball pits, grilling with friends, or at the dog park with John Wayne (my dog). Favorite place to travel: Right now I’d have to say Seattle. With Zillow being headquartered in Seattle, I get the opportunity to travel there frequently for product planning. It gets harder to leave every time I go. Favorite time of the year: Summer! I love being able to enjoy the outdoors as much as possible. Favorite thing about working at Mortech/Zillow: My co-workers. It takes great people to develop a great product. Favorite feature of Marksman: Marksman is very dynamic. Whether you’re a small community lender with a simple rate sheet or a large national lender that is hedging, Marksman can be configured to handle your pricing configuration and lead management needs. Marksman Insider Tip: Take advantage of all of the tools Marksman has to offer. While our core product is our pricing engine, we have a number of integrated products that allow you to easily manage your leads such as the Dynamic Pipeline, dialer, credit integrations, and a number of LOS integrations to export your borrower’s information.